Analysis Tuesday’s launch of Windows 10 S, a cut-down version of the operating system designed for the education market, has raised some interesting questions about Microsoft’s ongoing efforts to hit Google and Apple where it hurts. Traditionally Microsoft and Apple have carved up the school user base between them. Apple gained an early lead in this a decade or so ago by offering schools cheap licensing. Redmond did the same and the two ensured that impressionable young minds got used to their operating systems. But when Google launched ChromeOS, shepherded by the Chocolate Factory’s now CEO Sundar Pichai, it was a hit in US schools. Chromebooks were cheap, easy to administrate, and good enough for school use provided the establishment had Wi-Fi. As a result, over half of US nippers are using Chromebooks in the classroom now, and have Google accounts to run them. That’s good news for Google, but the situation worldwide is more fluid than that. Schools that don’t have a campus-wide Wi-Fi network aren’t that keen on Chromebooks, for good reason. While it’s possible to use some Google apps offline, they aren’t great and so for the non-US school population Google has made few inroads. Nevertheless, Microsoft has noted the shift and wants to change things. So it unveiled Windows 10 S to fight Google’s infringement of its space and get the next generation used to Windows software. 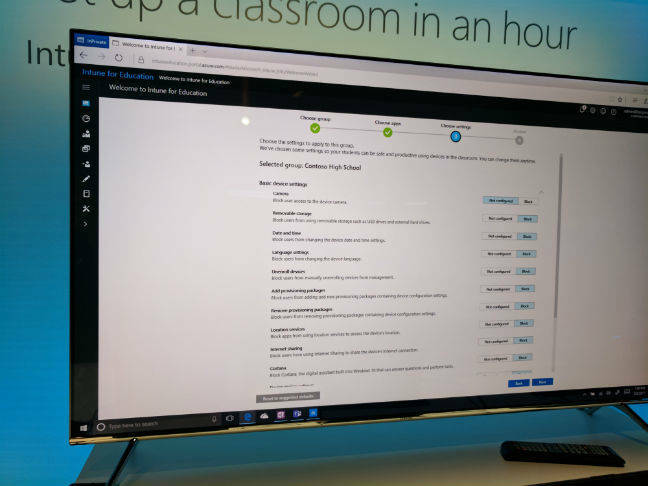 Windows 10 S takes the core of Redmond’s latest operating system and tunes it for education. The OS can only use apps that have been checked and cleared for use in the Windows Store. There's no access to the command line nor the ability to run your own scripts. This has good and bad sides. On the good side, Microsoft has been very disciplined in checking apps it hosts for dodgy security. The downside is that app makers aren’t fully sold on Redmond taking a cut of their profits and so plenty of apps aren’t available on Redmond’s shopfront. That’s not a problem, Microsoft insists. If you want an app that isn’t in the app store, Windows 10 S will suggest an alternative. If that isn’t good enough you can upgrade to Windows 10 Pro and download non-app store apps for a $49 charge. One area in which Windows 10 S really scores over ChromeOS is that it’s built from the ground up to be useful offline as well as on. You get the basic functionality you need if Wi-Fi is not available, but also access to apps like Office 365 when an internet pipe is available. The other secret source for the OS is how much Microsoft has embedded its Teams collaboration software in Windows 10 S. If I were an investor in Slack the new OS would make me very nervous – an entire generation is going to grow up using Teams and seeing Slack as something management imposes once (or if) they get a job. Windows 10 S also runs the full Creators Edition version of the OS. That means lots of 3D doodling and full support for HoloLens, something Redmond was keen to promote but which will face problems due to the high cost of headsets. $299 for a mixed reality viewer? For schools struggling with budgets it’s not really an option. The OS is also fairly useful at making do with lower-spec hardware. At today’s launch, Microsoft said the absolute base spec system to run the OS would cost just $189, which puts it on a par with Chromebooks. 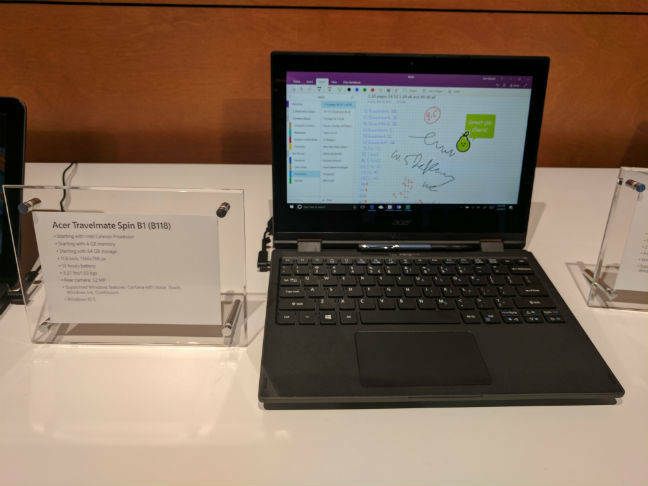 However, the bulk of laptops on display from Acer, Samsung, HP, and Dell were in the $300 ballpark, albeit with nice add-ons like a stylus and a touch screen. For administrators Microsoft has tweaked Intune to make widescale deployment relatively easy. A USB master stick formats a 10 S laptop quickly and it’s easy to set up usage policy for the group’s systems with a few simple mouse clicks. This hits Google where it hurts. Part of ChomeOS’ appeal for educational buyers is ease of administration, and from the looks of it Microsoft has an admin policy that matches Chromebook’s and will prevent little Timmy or Tammy borking their system.